Sherilyn Caine is the perfect wedding planner – she knows what needs to be done when and where and how. She is currently engaged to a man she has known less than a year and has recently moved from Chicago to Georgia, where she found the perfect job working with her best friend, Emma Rae Travis. 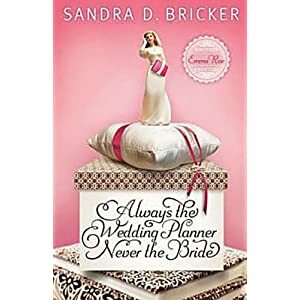 Sherilyn should be an expert at planning weddings but when there are problems finding her dress and problems with ex-partners, will Andrew Drummond IV and Sherilyn be able to tie the knot? Will Andrew’s mother be a problem? Will Andrew’s ex get in the way? Could Sherilyn’s wedding dress mishaps be a sign the couple shouldn’t get married? Could Sherilyn’s secret drive Andrew away? Honestly, I liked the book. It was a little slow in the beginning – I had a harder time getting into the story, but I did enjoy the recipes and lists that came at the beginning of every chapter. I was impressed with all of the fun recipes and bridal tips. I will definitely be trying some of the recipes because the book made the Australian Pavlova and Pettas sound so yummy. I thought Sherilyn and Andrew were good characters – maybe not as much depth and spiritual development as I would have liked but I they were real and had real problems to deal with. The story feels a little unresolved at the end, but maybe that’s because it’s part of a series (which I didn’t realize until after reading). I definitely want to read the first book, Always the Baker, Never the Bride, if I get a chance. All in all I would definitely recommend this book as a Christian romance that is light and easy-to-read. I received this book for free from NetGalley and was not required to write a positive review. My precious redhead said the same about this book and I look forward to reading it. The first book is a good read. I did a review on it at my blog this week if you’re interested.